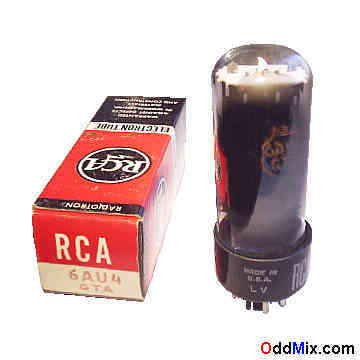 This is a genuine, vintage, RCA Radiotron 6AU4GTA Half-Wave Vacuum Rectifier electronic tube. Used for high-voltage, high-current, half-wave, pulse rectifier applications, in TV receivers or RF equipments. At one time these tubes were used in many special circuits, receivers, transmitters and transcievers. Excellent for replacement, antique radio, instrument restoration projects, experimentation, circuit research or to set up a private vacuum tube museum. It is NOS tube - New Old Stock, unused, boxed, excellent, collectible condition. First come first serve, only one of this rare, discontinued, historical vacuum tube available!